Media Partners Worldwide (www.mediapartnersworldwide.com) is a small radio advertising agency in Long Beach, which specializes in direct response advertising designed to compel people into action. Radio is in our DNA and we have enjoyed enduring success by utilizing broadcast, print, outdoor as well as satellite radio and digital platforms (video pre-roll, swipe-in engagement, search targeting, etc.). We are recruiting for a radio advertising position here at this agency. The job post is online at https://jobs.ziprecruiter.com/job/Media-Sales-Senior-Account-Executive/028ba3a6 - the contact email here to send submissions to is connectwithmpw@mediapartnersww.com. Ideally this would be a full-time role in-house, but as you are in San Diego, we also have commission only sale people who can work remotely. 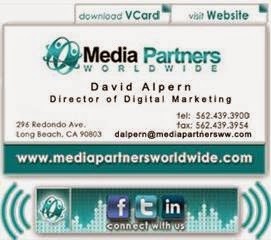 ~~Media Sales - Senior Account ExecutiveMedia Partners Worldwide (www.mediapartnersworldwide.com) in Long Beach, California is looking for a Senior Account Executive with 5+ years’ experience in Radio, TV and/or Mobile, Digital media sales. Our direct response media agency is seeking a driven, self-motivated, aggressive and creative senior advertising sales representative to sustain our continued growth through media sales. As a Senior Account Executive you will use your sales prospecting and closing skills to present on air and online marketing plans. Selling media advertising for radio and digital isn't like selling copiers or cell phones. A media sales senior account executive helps turn an intangible product or service into a unique marketing campaign by using his or her own creativity and partnering with the client. If you are focused, disciplined and have a successful track record in generating new business where you displayed the ability to establish and exceed expectations, we want to hear from you! This individual will play a primary role in securing new business, as such only applicants who provide a customized cover letter detailing their interest in this specific opportunity will be considered. We are an advertising agency, so view this as an opportunity to show us how well you can sell and promote the most important product you know of – yourself! Media Partners Worldwide (www.mediapartnersworldwide.com) is a full-service direct response media agency with 17 years media buying experience in radio, TV, and increasingly, digital. Our team comprises about a dozen loyal members, all of whom strive to be the best at delivering results for our clients while maintaining a fun and family oriented culture. Our offices are in a signature company owned building just a few short blocks from the ocean in lovely Long Beach, California.